Why Do You Make Me Hate You, Arrow? 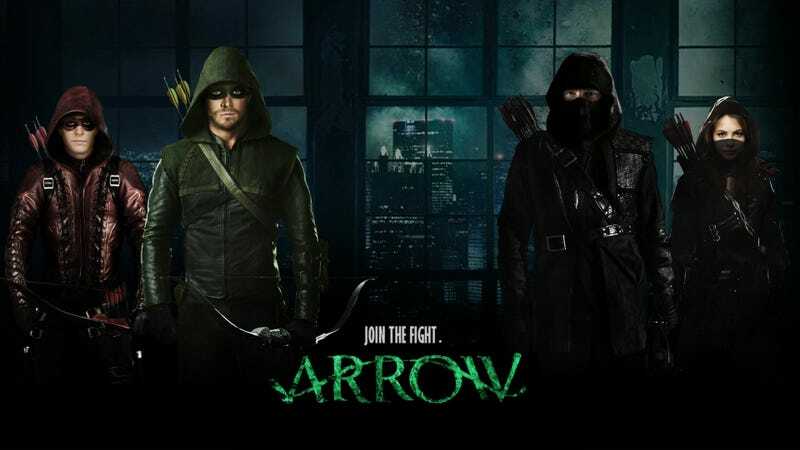 Arrow, I’ve been watching you for two seasons. We had some good times. Remember when Deathstroke was a thing? That was great. But upon completing your third season, the magic is gone. Amusement turned to frustration and frustration turned to hate. Oh where did we go wrong, Arrow? Ok, look, Arrow. I know I made fun of you at the beginning. I called you Batman Begins but with arrows instead of batarangs. And, well, you were pretty much Batman but you were also you! You were interesting and fresh despite the similarities. Now we’re in your third season and you are literally Batman. You got your own guy who makes people see scary stuff with a toxin. You had your version of Bane take over the city, complete with a big showdown on the streets. You got a pretty good Liam Neeson lookalike to play Ra’s al Ghul. I don’t think you have a Joker yet, but hey, season 4 is still young. You can do it if you put your mind to it, champ. I think the biggest problem with you, Arrow, is that you have too many secrets. Secrets we already know. Secrets you pretend are this week’s major gamechanger even though we’ve known about it for two to three episodes. And I’m not just talking about winking at the comic fan audience- actually wait, let’s talk about that. I get that you’re based on the comic. And I get that other shows like Gotham do it too. But every time you have the Atom say a line about making things smaller, what I hear is “I know you like the comics. Don’t worry, it’s going to be just like the comics.” Why are you toying with me when I know what’s going to happen? X knows Y is dead but won’t tell Z.
N killed Y but won’t tell X.
X and Z find out the secrets two episodes later. Drama ensues. Meanwhile Z knows M is alive and won’t tell X and Z. The cycle continues. You see the problem with that, Arrow? You’re not surprising me, you’re surprising your characters. You’re building your mystery around what the characters don’t know instead of what I don’t know. It’s like your flashbacks now. Back in season one the flashbacks were cool. I knew Queen was going to survive all the events, but I don’t know about the other characters. I don’t know how Queen went from a rich jerk to a seasoned badass. I wanted to watch and see how it turns out. But the flashbacks in season three? I know the outcome. You tell me what’s going to happen long before it happens. What are these flashbacks telling me that I don’t already know? I think we have a trust issue here, Arrow. You don’t think I’m smart enough. You don’t think I could “get” the your big reveals without showing me everything beforehand. You don’t think I’ll believe Ra’s al Ghul got his hands on a big bad McGuffin virus without giving me ten episodes of flashbacks. You’re so intent of giving me everything and pretending it’s a big deal than trusting me to be surprised on my own. Because you don’t give me anything to be surprised by, you expect me to be interested in the characters when they are surprised. This leads to so much drama that it would make Shakespeare blush and hide his manuscript for Hamlet under his mattress. So much of the drama you drum up is completely hollow or unavoidable that it is comedy. Really bad comedy. No, seriously, how am I supposed to take two episodes of all the sidekick characters morning the loss of Oliver Queen’s death and their subsequent dealing with the consequences when you constantly cut to good ol’ Ollie, alive and kicking? For that matter, your “kill-off” and “fatally wound” your characters so often that I’m numb to it. What do you think this is, a show based off a comic book? Part of this problem stems from your “keeping secrets” problem. All your characters keep secrets from each other for no other purpose than to reveal them at the peak dramatic tension point, just so it can blow up in their face. These are character who, I am told, love and trust each other. All the secrets, revelations, and and fallouts feel like hollow efforts to stir things up than make interesting character interactions. I mean, during your crossover episode with The Flash, one of the characters comments on how stupid it is that the characters keep so many secrets. Goddammit, Arrow, your sister show knows how dumb you are! You’re just so dumb and you don’t know it. Why is the Atom wearing Iron-Man armor? That makes about as much sense as Ant-Man having a green ring that can form giant hard-light boxing gloves. How does a man in his 50s manage to walk up to the Arrow and stab him in the neck with his fear toxin? I’m pretty sure Queen’s taken down, like, a hundred ninjas at this point. Why can’t the Flash catch Captain Boomerang after he runs out of the room? Why can’t your hacker use the computer she used to hack a GPS system to send a message for help directly instead of using the same computer to hack her mom’s Apple Watch to send a message for help? Arrow, I know you’re a superhero show. I’m prepared to put up with a certain amount of stupid. I hear the Flash has Clock king. Agents of S.H.I.E.L.D. is goof balls with it’s dorky source material. The Cape had the goddamn Carnival of Crime. These shows are dumb, but their dumb is endearing. You’re so ridiculously dour and dramatic all the time that anything you do that is silly or outright internally illogical it makes you look dumb. You are dumb. But instead of laughing with you, I’m laughing at you. Or I would be except I stopped laughing long ago. The “We’re not so different, you and I” speeches aren’t charming anymore. They’re terrible. You’re terrible. I hate you, Arrow, and I don’t hate many thing. Maybe it’s irrational. Maybe I’m crazy. But just know this, Arrow: You drove me to this. What we had back in season one is over. All I have left is rage at what you are now. I’m leaving you for, Arrow. I’m leaving you for The Flash. God help me.